Best view of the rookery (and County Jail!) is from the Samoa bridge. So you're a Great Egret and your home is the rookery on Indian Island -- which you share with a few dozen of your kinfolk -- and you've got it made. The fishing's good, you're safe from humans (who thoughtfully located your pad within the jurisdiction of a National Wildlife Refuge), and the future looks rosy. Except that every once in a while, usually during a storm, you notice that one of your home trees comes crashing down -- and you don't see a lot of replacements coming along. Which pretty much sums up the situation on the City of Eureka-owned section of the 270-acre island. That stand of non-native Monterey cypress was planted by Robert Gunther during his residency from 1860 to 1900, meaning that the trees are now nearing the ends of their lives. 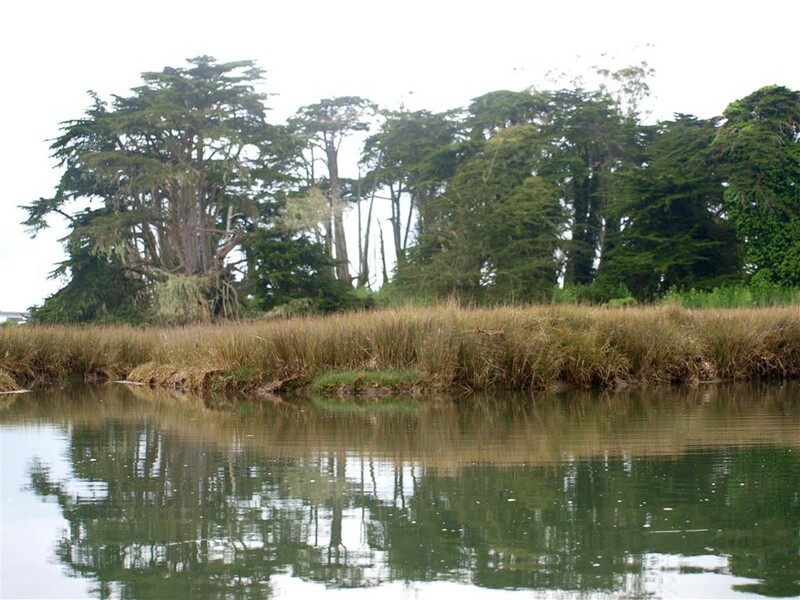 (The only native stands of Monterey cypress are near Carmel, at Point Lobos and Point Cypress.) Unfortunately for the egrets, cypresses don't continuously regenerate, as, for example, do most firs. Cypress saplings need plenty of sunlight -- absent under mature trees -- so most regrowth has to wait until the old trees begin to fall. Dave Lancaster of the California Department of Fish and Game says that this will result in a window of time, starting in the next 20 years, when most of the old trees have fallen and the new ones haven't sufficiently matured to attract egret colonies. Most of the year, the egrets, along with their Great Blue Heron cousins, aren't too picky about where they roost for the night. But during nesting season -- which we're in the middle of now -- habitat is critical. 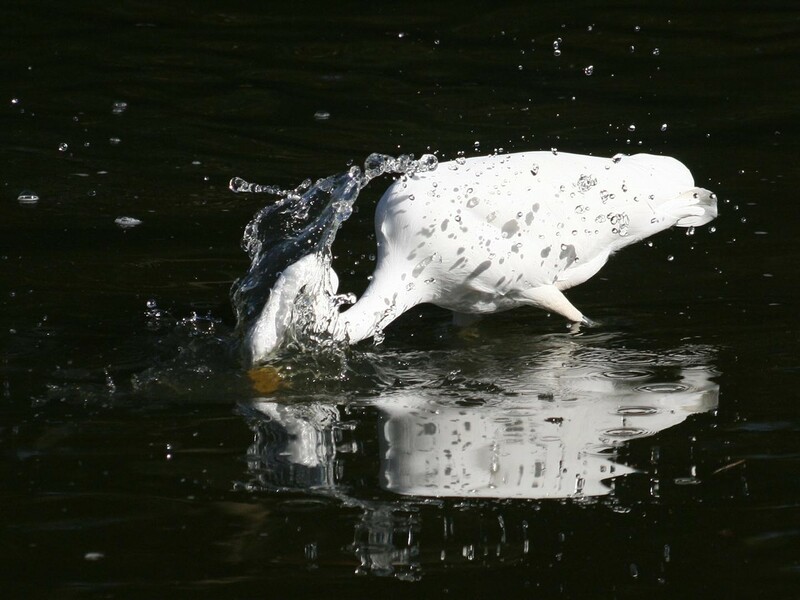 In the first phase, egrets lay from one to six eggs, which hatch about a month later. Then comes another month while the nestlings are fed by their parents, after which they figure out how to fly, followed by another month or so of hanging out with their folks. That's three months of the year when they need a strong, secure nesting site. 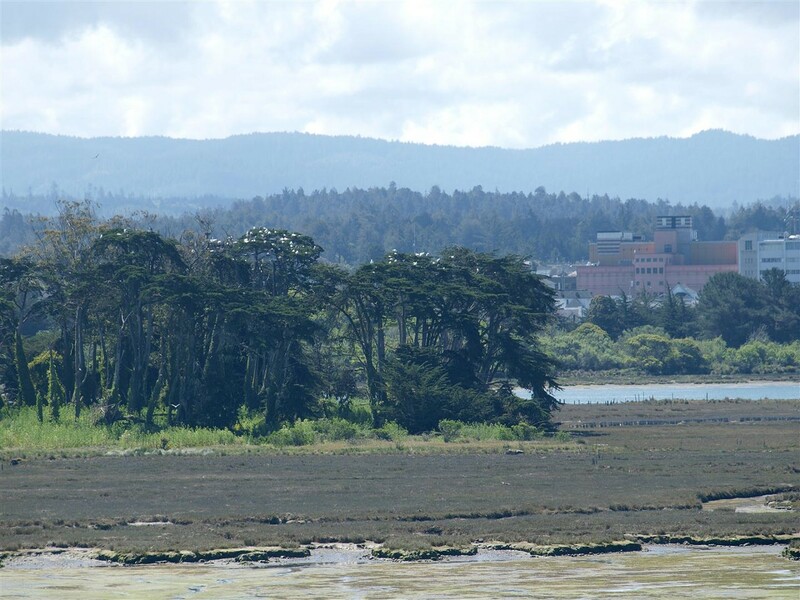 So what will happen when the birds look for spring quarters after most of the Indian Island cypresses have fallen? 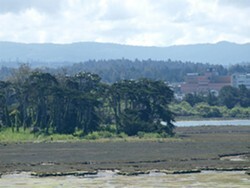 According to wildlife biologist Lancaster, they may either join their fellow egrets and herons at a privately-owned Monterey pine rookery off Table Bluff Road; start a new rookery; or split up into small scattered rookeries until the replacement Indian Island cypresses mature. This fall, the City of Eureka and the Fish and Game Department will be girdling the thick ropes of ivy wrapped around the trees, which threaten both stability and photosynthesizing ability -- "girdling" being a nice word for cutting the ivy off near the ground. Meanwhile, the U.S. Fish and Wildlife Service is developing a long-term restoration strategy. Enjoy, while you can, the sight of these graceful (until they land!) birds as they nest and roost on the cypresses of Indian Island. They're a part of what makes our corner of the world, as they say in the antipodes, godzone country. Barry Evans (barryevans9@yahoo.com) is contemplating his next life as a Great Egret. A compilation of his first 80 Field Notes can be found at Eureka Books.